We had a cousin sleep-over this weekend. Five kids age five and under. They had a blast playing with each other all weekend! It is SO much fun watching these kids grow up together. The big kids were off playing day and night (with minimal fights!) AND, we had all five kids in bed ((and sleeping)) by 9:00 both nights. Not too bad! This was a quick little activity to throw together and the big kids (age 5, 4, and 3) had SO MUCH FUN! 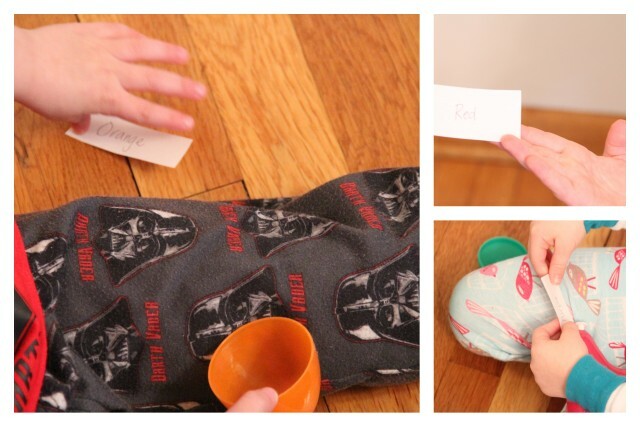 I wrote different colors on slips of paper and put them into plastic eggs. The kids got to pick an egg from the bowl and "sound out" the color on the slip of paper. Ok, my 5 year old sounded out the color with help. The other two said the first letter of the word and guessed the color. They were pretty excited to "read" the color on their slip of paper! So then, they had to run off and find something that was the color of the written word on their slip of paper...and it had to FIT inside the egg. I sat and waited for them to run back and show me what they found while they tried to fit it in their egg. They had a little trouble with some things, but this was a fun and different way to work on visual perceptual skills. 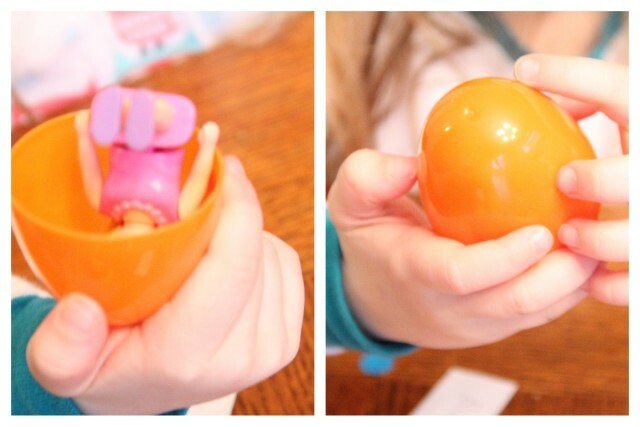 Will that little doll fit in the egg? We weren't sure by looking at it, but with a little fiddling, she did! Fitting the eggs together with the little objects inside was a great fine motor exercise. They found something for each color!